The villa is made of a large main room with living room area, dining area, fully equipped kitchen, 1 double bedroom with wardrobe, 1 bedroom with 2 single beds with wardrobe, small modern bathroom with shower, laundry room with washing machine, iron and iron board. Air-conditioning in the main room and in the corridor/sleeping area, TV, satellite and DVD player, internet wi fi, outdoors furniture, outdoors shower. Only 6km from Syracuse city, in the seaside area, 300 metres from a small gorgeous sandy beach! Possibility to organize Etna tours, Montalbano tour, Etna Wine tasting tour and Baroque cities tour upon previous request. Small modern bathroom with shower, sink, bidet, toilets and hairdryer. The kitchen (completely new!) is made of: fridge/freezer, 4 cookers, oven, microwave, kettle, toaster, a lot of varied kitchen utensils. Notes on accommodation: At the beginning of the lane, a small restaurant proposes typical Sicilian dishes and special dishes on order to take away, which can be very convenient for those who do not wish to cook everyday but do wish to enjoy the gorgeous terrace! Outside: 1600 sqm well kept garden, 2 terraces. Outdoors furniture (2 dining tables). Outdoors shower. Cleaning / Towels / Linen / Maid service: Towels and linen are provided and included in the price. Cleaning before arrival and after departure is also included in the price. A weekly cleaning at the end of each full rented week is included. Other: Laundry room with washing machine, iron / iron board. This is a small villa but the garden is immense and the pool is lovely. The kitchen is well equipped and there is also a utility room where there is extra storage space. Outside the patio is shaded so ideal for eating and relaxing. Stephanie, who manages the property is very helpful and always available to deal with any issue. Her restaurant recommendations were excellent. The owner of the villa is also very nice and the small plumbing issue we had was dealt with within a few hours. We had a wonderful holiday and look forward to our return. Superb Villa with amazing garden and pool . Very good quality garden furniture and the pool a godsend after a busy day exploring the area .you do need a car but there are some excellent fish restaurants within walking distance, and of course the pizzeria at the end of the lane. Stephanie was extremely helpful and gave excellent advice on where to eat in Beautiful Ortigia . Visited Noto a couple of times which was stunning , great choice of restaurants and amazing architecture.Although close to Syracuse the Villa is in a very quiet residential area. We look forward to a return visit ! 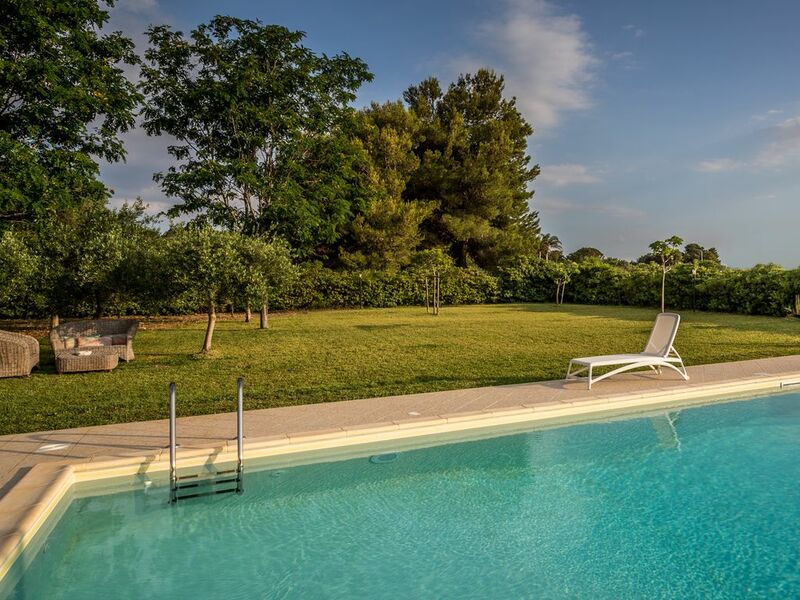 The property was in excellent condition and the pool and garden areas were fantastic with lots of chairs & sun loungers. It is in a quiet area with a restaurant 100 yards away and the delights of Ortigia 5 miles away. On arrival the owners had filled the fridge with beer wine & water and the biggest basket of fruit I have ever seen. We thought this a lovely touch and we very much enjoyed eating and drinking the contents. Stephanie who manages the villa was excellent, not only going through all the facilities in the villa but also giving us lots of tips on places to visit and where to eat. At the end of the holiday she even offered to sort out a parking fine that I had picked up which was very helpful. I would recommend the villa as great value for money and a wonderful place to spend time. Lovely property, especially the outside space - pool was fabulous, sitting/eating out areas comfortable and well positioned so you could always be in the shade, we spent more time outside than in. Temperatures in the high 30's when we were there so it was really refreshing to come back early afternoon from sightseeing and relax in the pool. Welcome pack was thoughtful, Stephanie was great, came to the supermarket to meet us so we could get some provisions before arriving, and she gave us some useful tips on eating out in the area. We went to l'onda blu just down the road - delicious food and very reasonable. We also ate at l'asteria blu which I also recommend. If cooking in, then counter top space for preparation was limited but a big fridge and washing facilities were good. Shower was a little small and took ages to drain away! Bed was comfortable in the main bedroom, it was just the two of us so can't vouch for the twin beds next door. Easy to reach the main road to either Noto or Taormina/Etna and Syracuse only 15mins away - 2 supermarkets. Cet été nous avons découvert un petit coin de paradis dans cette location. Très bon aménagement et d une superbe propreté. Une magnifique piscine d eau salée dans un superbe jardin méditerranéen. Et que dire de l accueil de Stéphanie toujours prête à vous rendre service que dire aussi du jardinier accompagné de Luciano (des personnes exceptionnels) ainsi que de la femme de ménage. Nous avons passé 15 superbes jours et rien mais rien à redire. C est sur nous reviendrons. J en profite pour saluer toutes les personnes que J ai nommé. The garden is lovely and the pool is fabulous. The kitchen was well equipped and We were met by Stephanie who was very efficient and answered all our queries in a quick and efficient way. I felt the property needs updating. The bathroom is old fashioned and shower is not powerful. The layout of the property is good but the furnishing is basic. 300 metres from the villa you can enjoy a small gorgeous sandy beach! Closest airport: Catania Fontanarossa (55 mn' driving distance). Siracusa city: 6 km. Noto: 30 km.